Decades ago, when the Texas economy was not as diverse as it is now, the boom-and-bust cycle of oil production could wreak havoc on our lives in Houston. Even today, we feel the effects as energy companies cut back. Sure, cheap gas at the pump is nice to some, but we know it comes with many different kinds of costs. Here’s another cost we now must consider: prices for recyclable materials have plummeted in part due to low oil prices and reduced demand. For now, tossing our trash into landfills appears cheaper than recycling. 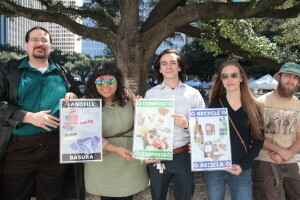 As a result, and spurred by the more immediate financial challenges at City Hall, several newly elected Houston Council members are arguing that we should “suspend” curbside recycling. Giving in to such a short-term, one-dimensional viewpoint would be the wrong thing to do as a leading city in the 21st century. Back in 2008, the New York Times called out Houston for having one of the nation’s worst recycling rates – an abysmal 3 percent. City leaders ever since have responded by ramping up recycling. As of this past year, curbside recycling finally reached every single-family home served by the city, and our diversion rate has increased to around 20 percent. The current call to eliminate curbside recycling, however, confirms the need to commit to long-term recycling goals. One challenge is that most Houstonians aren’t even seeing, let alone paying, the true costs of landfills. In the business world, this is called an externality because it means externalizing what should be an internal cost. Roughly 40 percent of Texas landfills that are required to monitor for groundwater pollution are leaking. Landfills often have long-term pollution and safety costs that are borne by we the taxpayers or property owners. Just ask the neighbors in Waller County, who have spent over $1.5 million fighting a proposed landfill from being built, or the city of Austin, which will pay more than $1 million per year for 30 years to care for a closed landfill. “Cheaper than recycling” is part of the landfill illusion. Much of the invisible cost of wasting is also upstream. Mining for raw materials generates immense pollution, and the degradation to the air, land and water is often never repaired. Transporting, refining and manufacturing those raw materials into products consumes tremendous amounts of energy. Recycling can reduce these life-cycle costs dramatically. For example, it takes nine times more energy to make an aluminum can from raw materials than from recycled aluminum. City Council won’t see these pollution savings on a balance sheet when they vote on Wednesday, but if they stop curbside recycling in Houston, the environment will pay for it up and down the supply chain. There are also social justice costs that we cannot ignore. Environmental burdens are borne disproportionally by the communities that live closest to landfills, as Council member Jerry Davis pointed out last Wednesday. Decades ago, Dr. Robert Bullard, Texas Southern University’s dean of the Barbara Jordan-Mickey Leland School of Public Affairs, developed the idea of environmental racism when he discovered that waste facilities, landfills and now-closed incinerators in the Houston area were disproportionately located in black and Latino neighborhoods. Race has been a bigger factor than class in determining where these facilities are sited. Responsible recyclers and composters, on the other hand, stop landfills from growing and generate jobs for the working class. Sustainable industries that conserve the planet’s resources and reduce greenhouse gas emissions are precisely the kind of economic development areas that we should be focusing on. According to a 2013 study by the Houston-Galveston Area Council, the recycling, reuse and remanufacturing industries in the Greater Houston area contributed more than $4.2 billion in industrial output and more than 21,000 jobs. City Council can help build on that foundation by voting to continue curbside recycling, an issue that will be before council on Wednesday. Certainly, recycling isn’t a silver bullet that will solve all of our waste problems, but landfilling is far worse. We need to prevent and reduce waste right from the start, reuse everything we can after that, and yes, recycle the rest. Council has an important decision Wednesday to either stick with our values or give up when times get tough. We are hopeful that with enough citizen input, they will keep us moving in the right direction. Scruggs is Houston program director for Texas Campaign for the Environment.